As you guys know, I’m all about my natural sweeteners. Natural, more nutritious forms of sugar that are low GI, don’t spike our blood sugar levels and even contain a little bit of nutrition are always going to be welcome in making our food – and life – that little bit sweeter. Of course, not all natural sweeteners are created equal. Some, like agave syrup, while certainly not the worst thing in the world, are still highly processed and don’t contain any more nutrition than refined white sugar. Natural they may be, but healthy not so much. Dr Michael Greger has an awesome video on this explaining more about natural sweeteners, which you should definitely check out. Over the last few years my go-tos have been maple syrup, coconut sugar and molasses. Brown cane sugar, though more refined, is still better than white and great for baking with as an occasional treat. There are some other good options too, but these ones are my favourites. One natural sweetener I’d been wanting to try for ages was date sugar. Made from basically just ground-up dates, it is technically still a wholefood (yep you read that right) and actually one of the healthiest sweeteners around. So when Buy Wholefoods Online asked if I’d like to review some, I of course said yes. Since then, I’ve been loving incorporating this healthy sweetener into my meals, and now I’m keen to share it with you. Let’s break down some of the reasons why date sugar is so great. The fact that a thing like date sugar exists means you can still have all the sweetness in your diet you want, while also packing in a ton of nutrients and none of the guilt. 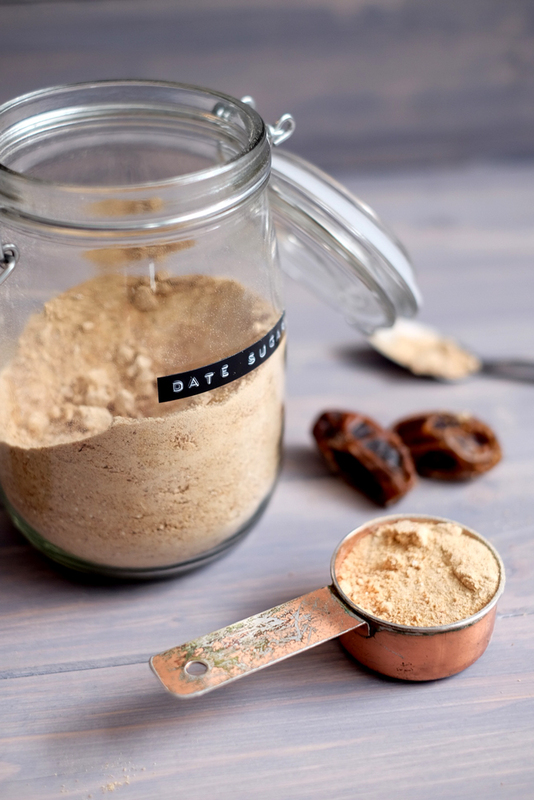 Because it is made solely from ground up dried dates, date sugar contains all of the health benefits of dates but in a more convenient, accessible form. This means it is high in fibre and nutrients, instead of just being empty calories. It’s also a great source of iron, potassium, magnesium and calcium. If you’re trying to tame your sweet tooth and cut down on the amount of processed sugar you eat, give date sugar a try. Thanks to its fibre content, it’ll give you the sweet taste you’re looking for, whilst also helping you feel more satisfied – something regular sugar won’t do. Two of the most common ways I’ve been using date sugar is by sprinkling it on my porridge in the mornings, and using it to make my 5-minute healthy chocolate mug cake. But I’ve also been using it to sweeten sauces with great success, and I imagine it would be great at caramelising roasted vegetables, tempeh or tofu, or sprinkling onto homemade popcorn. 2/3 cup for every cup of white sugar. Date sugar can also sometimes soak up more of the liquid of whatever it’s being mixed with, so you may have to add a little more liquid to get the desired consistency. One thing date sugar won’t do is entirely dissolve when stirred into hot drinks, so you probably don’t want to use it for your tea or coffee. However, if you’re sweetening a smoothie or making any kind of frothy drink in your blender, date sugar is fine to use as it’ll be mixed in more thoroughly. Date sugar can be purchased online via Amazon or another health food provider like Buy Whole Foods Online (here is the one I am using). However you can probably also find it at your local health food store. What do you guys think, will you be trying date sugar any time soon? Leave your thoughts in the comments below!